The 2030 Agenda for Sustainable Development commits all 193 UN Member States to achieving 17 Sustainable Development Goals (SDGs) through collective efforts between a wide range of stakeholders, including governments, the private sector and civil society. The 2030 Declaration specifies roles and responsibilities for civil society to play but is ambiguous on how partnership structures would be forged at the national level. The Addis Ababa declaration on financing the SDGs is fuzzy on how civil society participation will be financed. A team of PTF experts have analyzed several global trends concerning civil society’s role in development and their implications for various stakeholders in Civil Society & Development: Global Trends, Implications and Recommendations for Stakeholders in the 2030 Agenda to build a better understanding of the benefits, challenges and modalities for CSO engagement. With these changes come new demands for transparency, accountability, legitimacy, and impact. 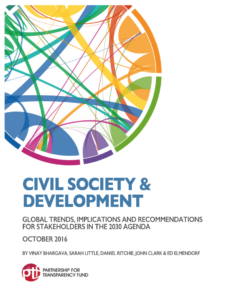 In its concluding section, the paper discusses the implications of the six trends and makes recommendation linked to the implications, for stakeholders in government, official donors (bilateral and multilateral organizations), philanthropists and other private donors and civil society itself during the fifteen-year period of the 2030 Agenda (2016-2030).